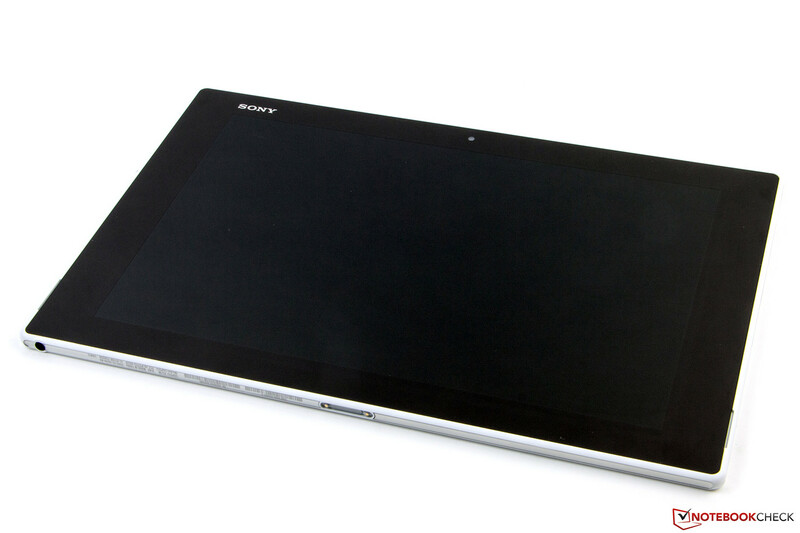 The Sony Xperia Z2 Tablet is the successor of the Xperia Tablet Z. The changed name is a bit confusing at first, but it does actually make sense because the tablet is now closer to its smartphone sibling. 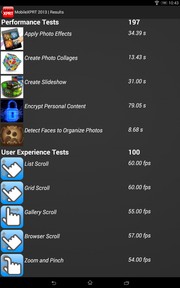 Compared to the predecessor you get the latest hardware and the current Android version. The combination is supposed to improve the battery runtime by one hour without increasing the battery capacity. 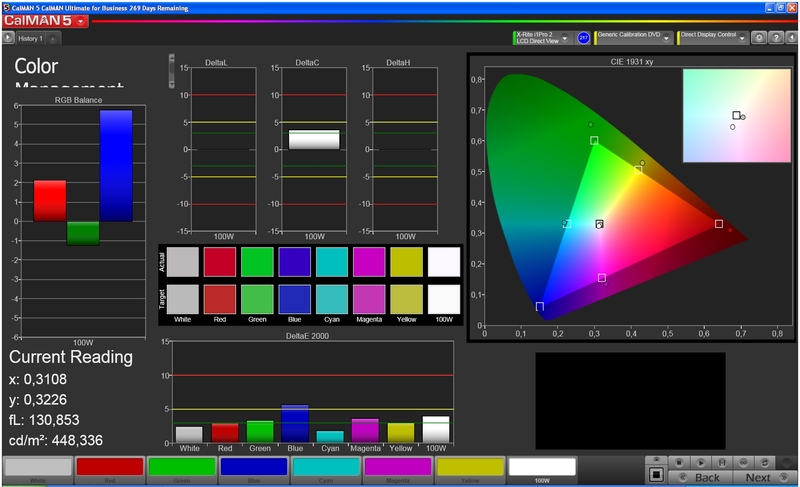 The display resolution has not changed, but the panel is supposed to have even more brilliant colors now. The IP-certification was expanded to IP55 and IP58. Sony's Xperia Z2 Tablet (32 GB, Wi-Fi only) retails for around 549 Euros (~$752) and is therefore slightly less expensive than the similarly equipped competition. The Apple iPad Air costs 20 Euros (~$27) more and the Nokia Lumia 2520 is just 50 Euros (~$69) more expensive, despite the LTE support. Samsung's Galaxy Note 10.1 with the same storage equipment starts at 459 Euros (~$629). The Surface 2 is available for 400 Euros (~$548), just like the Google Nexus 10. However, none of the rivals are waterproof or dust resistant. The back is made of plastic, but provides a good grip. The dimensions of the Sony Xperia Z2 have hardly changed compared to the predecessor. Width and depth (266 x 172 millimeters; ~10.5 x 6.8 inches) are identical, but with a height of just 6.4 millimeters, (~0.25 in) it is slightly thinner than the Tablet Z (6.9 mm; ~0.27 in) and significantly thinner than the iPad Air (7.5 mm; 0.30 in). 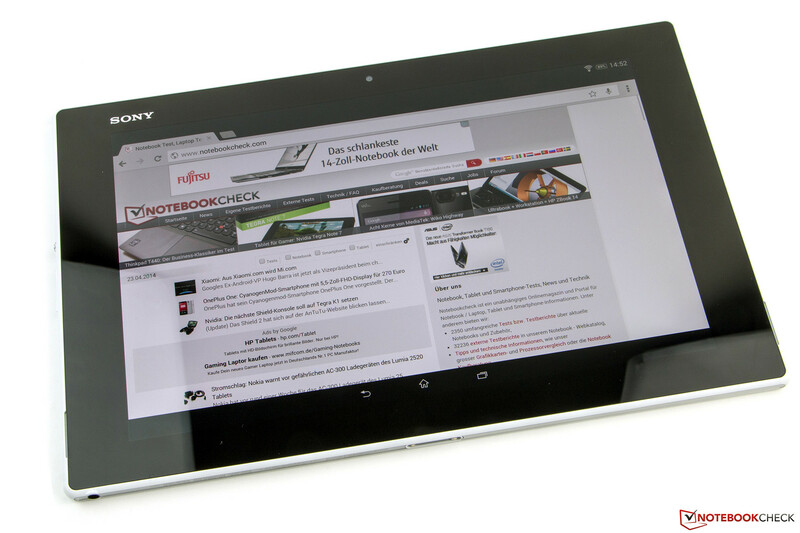 Sony therefore still offers the thinnest tablet in this device class. It is also very light, weighing just 425 grams (~15 oz), which once again beats the rival from Apple that is 39 grams heavier (~1.4 oz). The other competitors are noticeably heavier as well. The design follows Sony's own Z smartphone-series, but, unfortunately, that cannot be said about the materials. 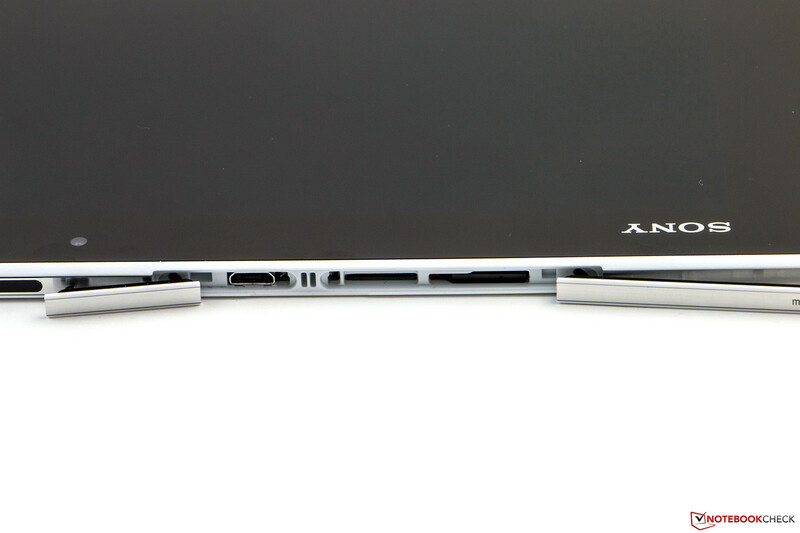 While the Xperia Z2 uses aluminum and mineral glass, our review unit is completely made of plastic. The buttons are made of aluminum and the display uses hardened glass. The rest of the case only uses plastic and the device is available in black and in white. The back feels slightly rubberized, which gives the tablet very convenient haptics and a good grip. The black version of the Z2 Tablets easily attracts fingerprints, but you will have to look very closely to find them on the white version. The stability of the case could be better. The comparatively wide frame can be pushed in next to the display, which creates small picture distortions. However, that should not be a very big issue in practice. There are audible creaking sounds when you twist the tablet, but we could not find any problems with gaps. One highlight is the IP-certification of the device according to IP55 and IP58. This means it is protected against dust and sprayed water from every direction, and also against continuous submersion. The latter is limited to a water depth of 1.5 meters (~4.9 feet) and a period of 30 minutes if all the ports are covered as intended. You can therefore use the tablet in the kitchen or the bathroom, at least if you do not let it drop into boiling water. The bathtub on the other hand is no problem. There should not be any issues with the lithium-polymer battery, either. The battery is only damaged with temperatures of 60 °C (140 °F) and more; the standard Middle European bathing temperature is around 43 °C (109.4 °F). The Lumia 2520 (8.9 mm, left) is noticeably thicker than the Xperia Z2 Tablet (6.4 mm). 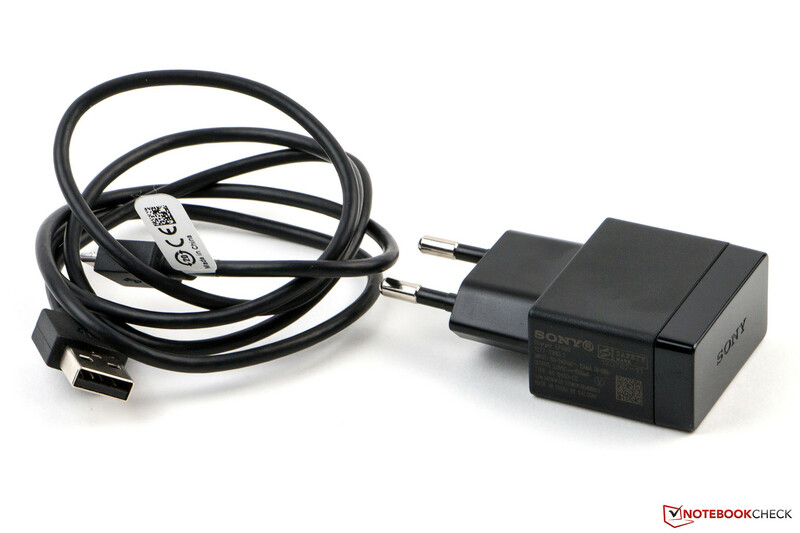 The Sony Xperia Z2 Tablet has a multifunctional micro USB port. It supports the USB 2.0 standard as well as MHL 3.0 and OTG. This means you can charge the tablet with this port and transfer data. Attaching peripherals like mice or USB sticks in no problem with the corresponding OTG adaptor. If you do not want to stream the tablet picture to a TV via Miracast, you can also use MHL 3.0. The corresponding (optional) cable is simply connected to the HDMI port of your TV and the port also supports UHD content. The micro SD card reader supports storage devices with a capacity of up to 128 GB. The docking port at the bottom is designed for the optional charging station. You can charge the tablet with this connector without continuously removing the cover of the charging port. The operating system of the tablet is Google Android 4.4.2 KitKat, which is the latest version. 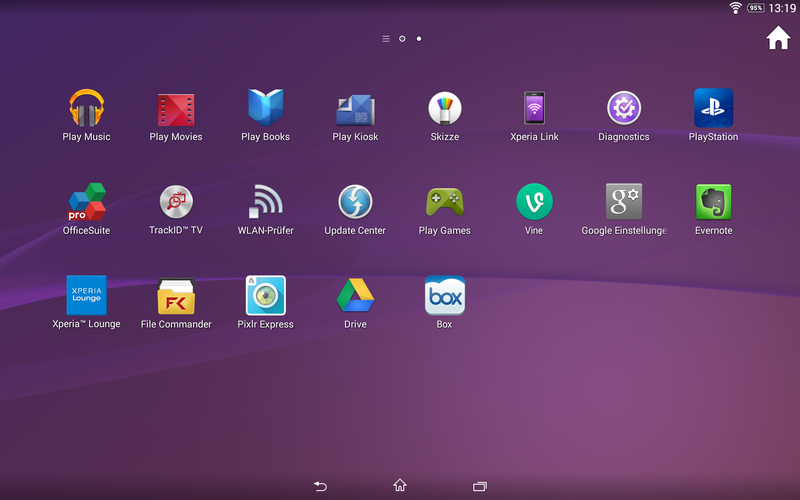 As usual, Sony equips the tablet with its own user interface that adds additional features compared to stock Android. You get several widgets and apps that are primarily focused on media playback in combination with the paid Sony Entertainment Network, but there are hardly any changes compared to the predecessor. 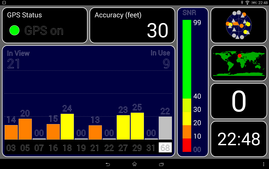 Our review configuration of the Sony Xperia Z2 Tablet can establish an Internet connection with a modern WLAN module. It supports the IEEE-802.11 standards a/b/g/n/ac in 2.4 and 5 GHz networks. Data transfers are possible with up to 433 Mbps and the range of the component is good. We could still browse the web at a distance of 20 meters (~66 feet) from the router. The damping of the tablet is just at 65 dBm, even though there is a wall in between. This value drops to 38 dBm in direct proximity to the router (Fritz!Box 6360). You can further increase the range with a very powerful router. A version with an LTE modem is available if you want to use the Internet on the road. Sony charges 100 Euros (~$137) more for the version, but it is only available with 16 GB internal storage. Besides Ant+ there is also NFC support. The former is a local wireless technology, which is primarily used for fitness accessories like heart rate monitors. We are not completely sure if that makes sense for a tablet. Bluetooth 4.0 is supported as well and worked perfectly in our review: We could not determine any issues with music streaming, even if we exchanged data at the same time. The VoIP features are just average. While the other person is still easy to hear via Skype, our voice is very distorted with occasional dropouts. It is not surprising that Sony recommends the use of an optional Bluetooth headset for calls with the LTE version. The integrated GPS module reliably established a connection to the satellites. Our position was located very quickly and precisely outdoors. 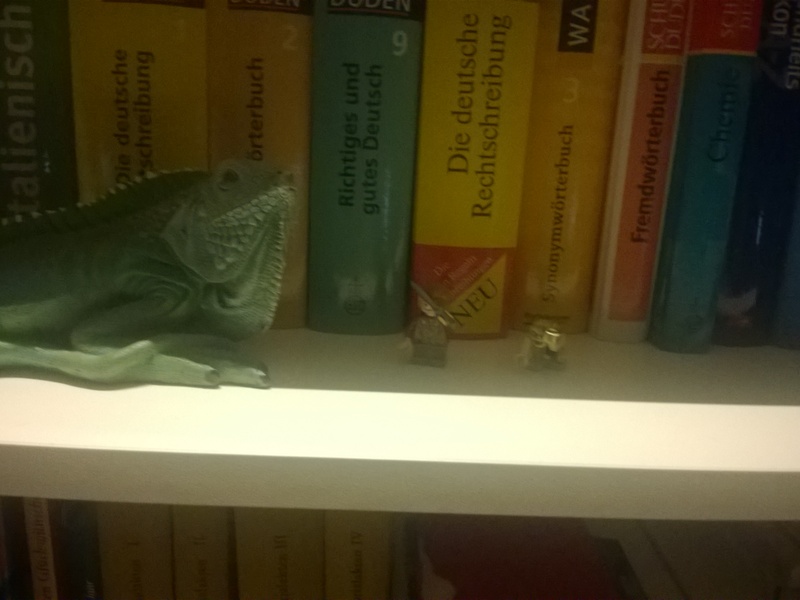 It took a while indoors, but it was still possible. 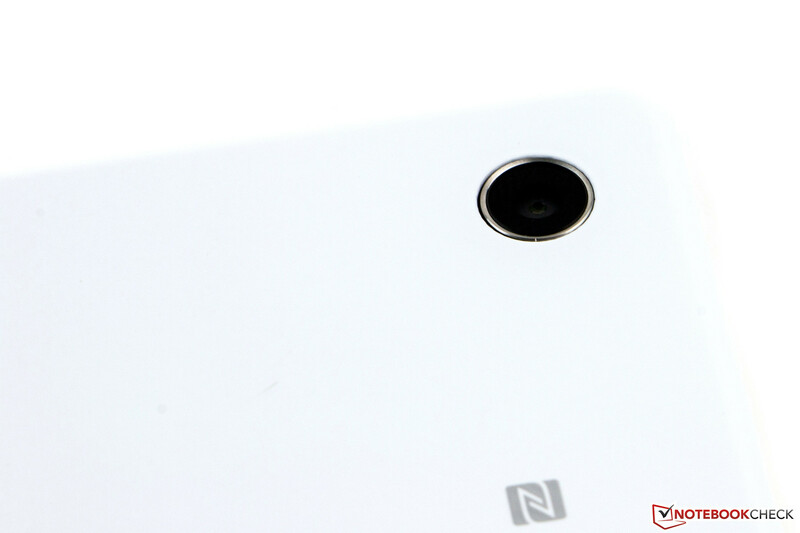 The Sony Xperia Z2 Tablet has two cameras. The webcam has a 2 MP sensor (1920x1080 pixels, 16:9) and can be used for video calls. 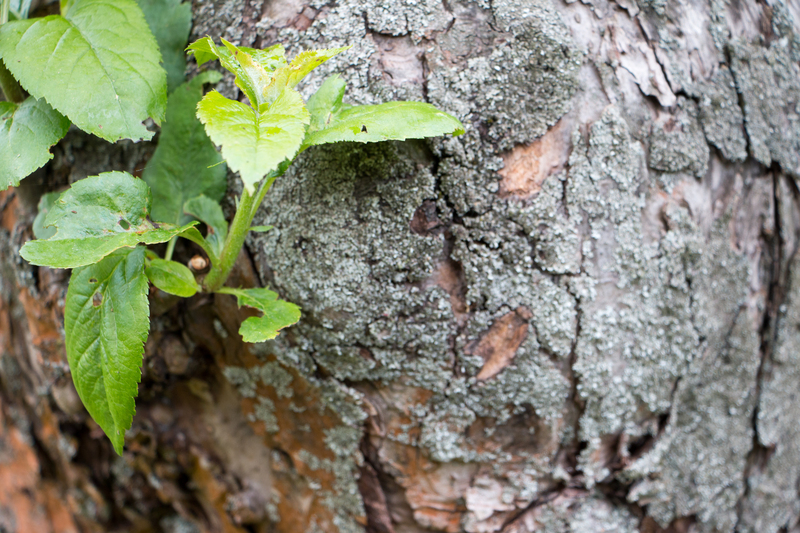 You still get reasonable results in darker environments, but there is strong picture noise. Pictures appear blurry and lack sharpness. The main camera on the back works with up to 8 MP (3264x2448 pixels, 4:3), but the resolution is only possible in the manual mode. 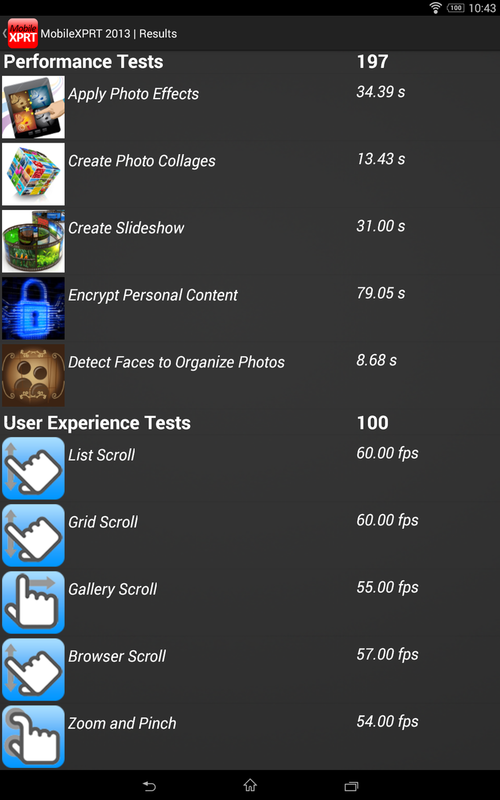 The automatic mode slightly reduces the resolution and only uses up to 3104x2328 pixels (7.2 MP, 4:3). 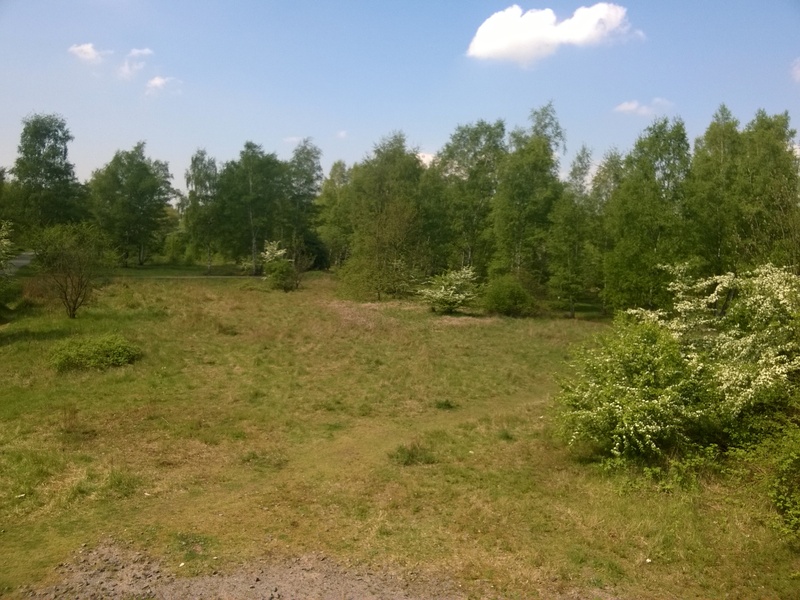 The size is reduced to 5.4 MP (3104x1746 pixels) if you maintain the default 16:9 setting. Good lighting conditions result in colorful pictures with a decent illumination. 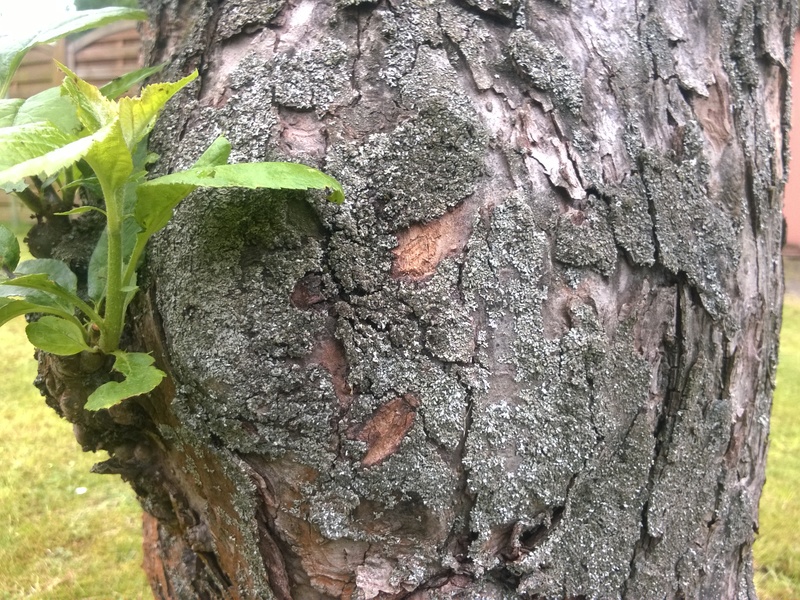 Unfortunately, the sharpness cannot completely convince us and the same applies for the details. The sensor is not supported by a flash and has problems in darker environments. The pictures lose sharpness and the colors seem to have a gray film. Finally, there are problems with picture noise. The software of the camera on the other hand can convince us with several features. 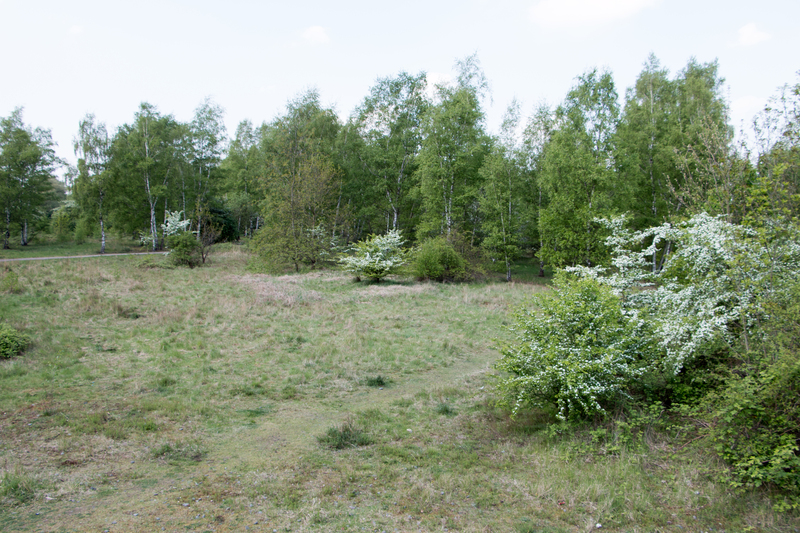 You can create HDR images and apply several filters; panoramas are possible as well. 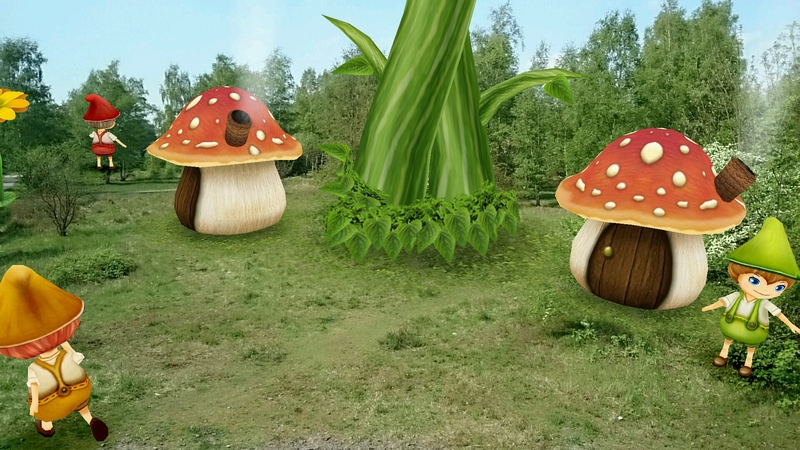 The Augmented-Reality mode (extended reality) lets you create different environments, where animals, dinosaurs or fantasy creatures walk through the picture. Videos can be recorded in Full HD (1920x1080 pixels), and the results are good in calm scenes. A lot of movement, however, results in blurry details and skipped frames. 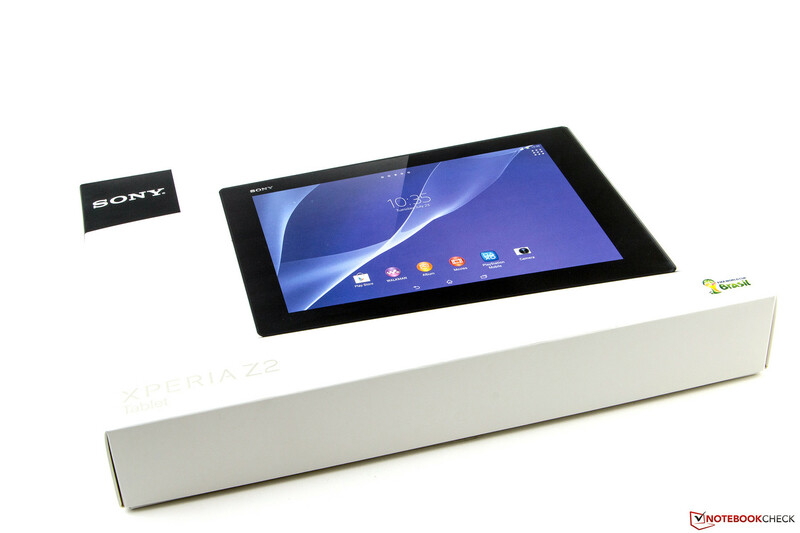 There are not many accessories in the box of the Sony Xperia Z2 Tablet. Besides the tablet itself, there are numerous quick start guides in different languages. Furthermore, you get a data cable and a modular power adaptor (1,500 mAh, 5 Volts) with a nominal output of 7.5 Watts. The optional accessories are diverse. Sony offers two charging stations: One of them has an additional Bluetooth speaker (BSC10), while the other one can only be used to charge the tablet. The manufacturer also sells a stereo microphone (STM10) as well as several covers, a remote control and a PlayStation gaming controller. Fortunately, most accessories are also compatible with the Xperia Z2 Smartphone. Sony grants a warranty of 24 months for the Xperia Z2, which cannot be extended. 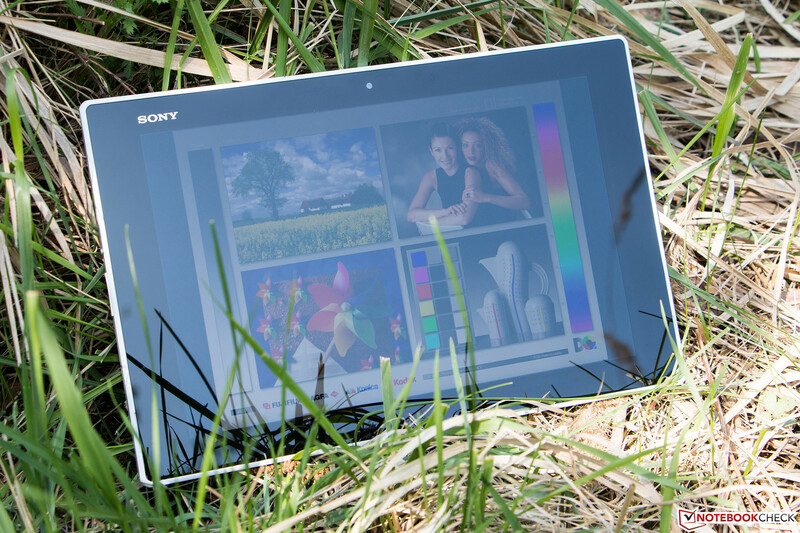 The Sony Xperia Z2 Tablet has a 10.1-inch touchscreen. 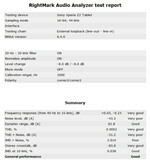 There are reports on the web that the touchscreen does not recognize inputs. Especially devices from the first generation have this problem, but it can easily be solved with an update from Sony. This patch is easy to install and removes the problems, after that the touchscreen works really well and recognizes up to ten inputs simultaneously. Only the peripheral zones may require a second input. Otherwise, the screen is very precise and offers good gliding capabilities. Sony provides its own keyboard layout, which looks very nice and simple. 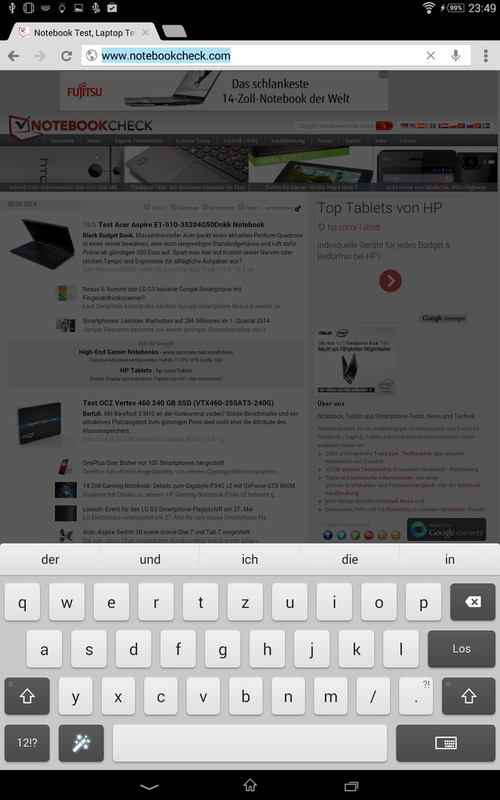 There is a lot of room for typing both in portrait and landscape mode, but that is mainly a result of the large display. The generous space could have been used for another row with keys, for example for numbers or frequently used special characters. The physical buttons have a clear pressure point and work very reliably. 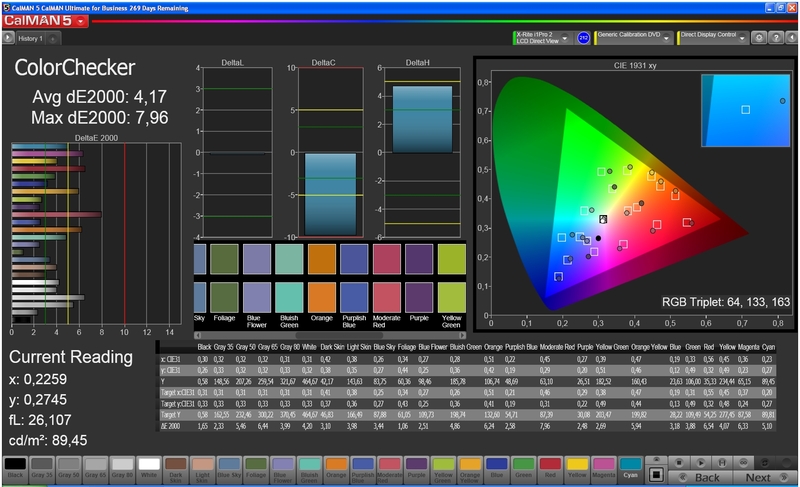 The Z2 Tablet has a very colorful display. 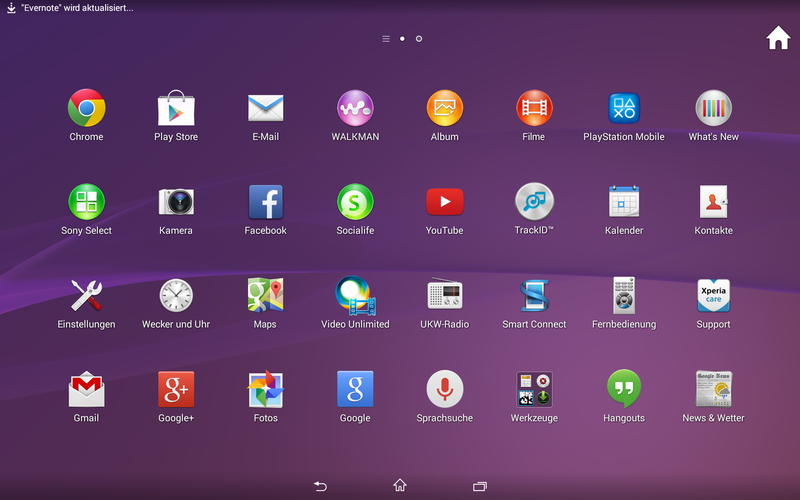 Similar to the predecessor, Sony equips the Xperia Z2 Tablet with an IPS display and a resolution of 1920x1200 pixels. 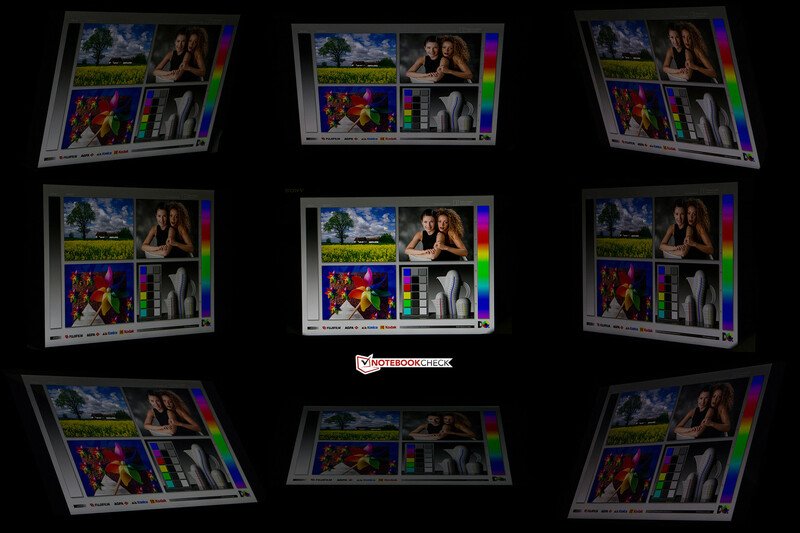 The resolution is therefore slightly higher than a standard Full HD panel; the aspect ratio is 16:10 with a pixel density of 224 ppi. 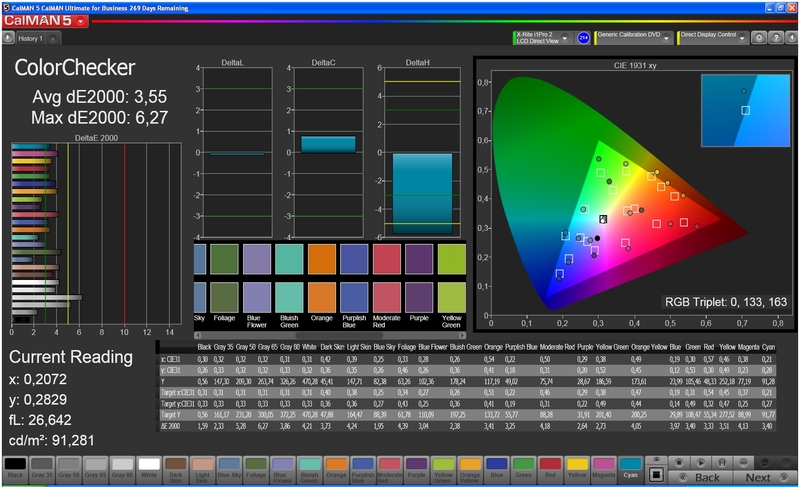 While the Tablet Z still used the Sony Mobile Bravia Engine, the screen of our review unit uses the latest Triluminos technology, which is supposed to create more vivid colors. There is actually a small Wow-effect when you use the device for the first time because of the rich and intense colors. The brightness of the panel has been increased compared to the predecessor (up to 346 cd/m²) and now reaches up to 461 cd/m². The brightness distribution is very even at 89%. It is at the same level with the Surface 2 (388 cd/m², 89%), iPad Air (473 cd/m², 90%) and Galaxy Note 10.1 (414 cd/m², 88%), but cannot keep up with the 750 cd/m² of the Nokia Lumia 2520. We could not determine any screen bleeding. The Sony Xperia Z2 Tablet (right) cannot compete with the luminance of the Lumia 2520. The black value of the Sony Xperia Z2 Tablet is decent with 0.59 cd/m². It is the same situation with the contrast ratio of 781:1, although it cannot keep up with the great values of the iPad Air (0.41 cd/m², 1,154:1). 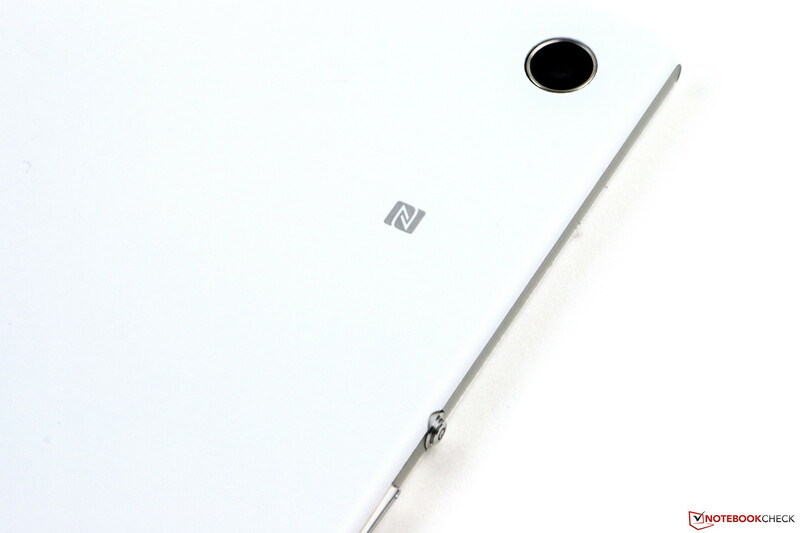 Because of the higher brightness, the Z2 Tablet is also beaten by the Tablet Z (0.39 cd/m², 887:1). 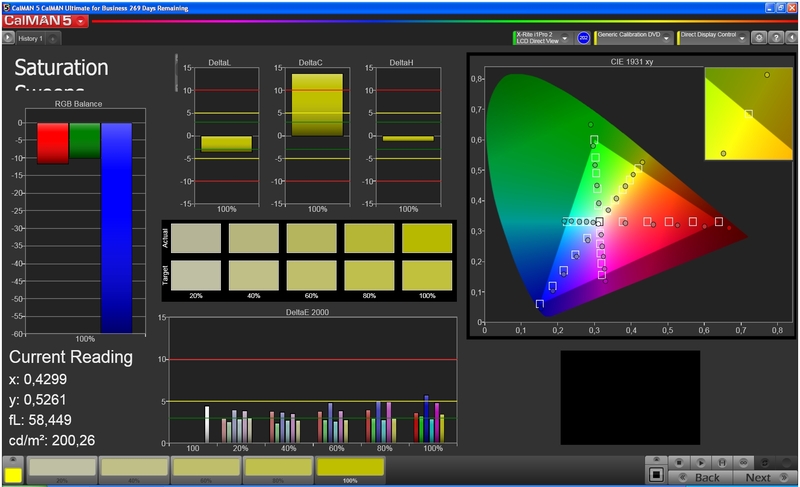 Sony promises good color space coverage, but does not get more precise about the specs. However, the color accuracy is actually pretty good and the criticism is only on a very high level. 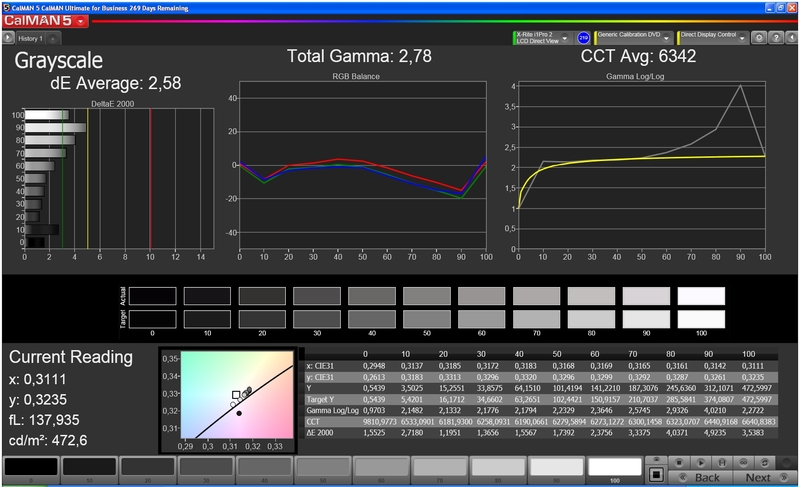 The grayscale presentation is very good and manages an average DeltaE deviation of 2.6. It is impressive that even pure white does not show a color cast. 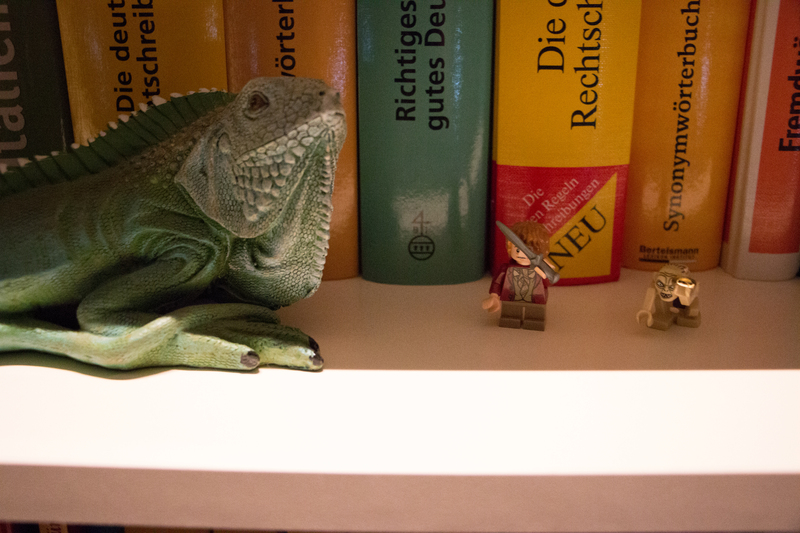 You can, however, create one when you adjust the white balance according to your preferences. The analysis of the saturation shows that the colors are slightly over saturated, but this is, at least subjectively, very convenient. Overall, Sony offers a very good and well-balanced display. The Sony Xperia Z2 Tablet also works pretty well outdoors and you can still see the display content in bright environments, but the glossy panel surface can be annoying with wider viewing angles. You should, however, avoid direct sunlight because the device is brought to its limits in this scenario. The situation is much better in the shade, where you can still use the tablet on sunny days. Nokia's Lumia 2520 is the reference device in this section; a direct comparison with our review unit can be found in the video of this review. You cannot see very much under direct sunlight. 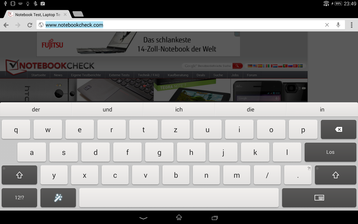 The glossy display affects the readability in bright environments. It is, however, very comfortable to use in the shade. 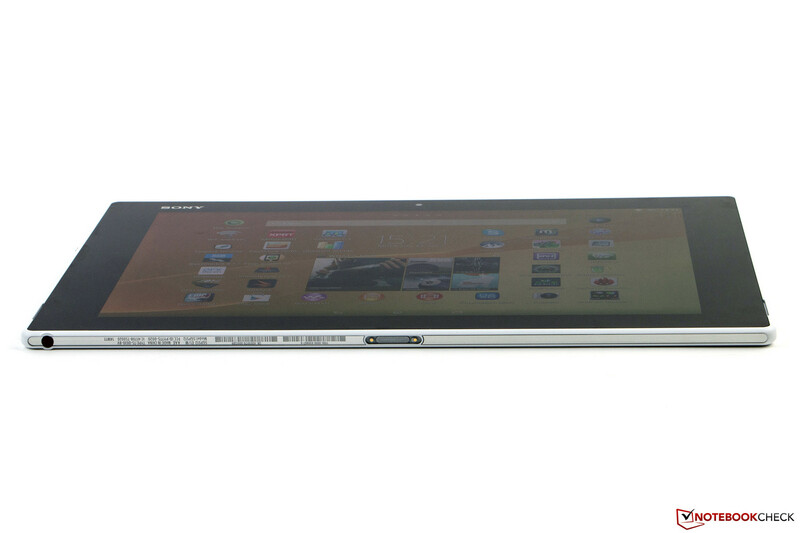 Because of the IPS technology, the viewing angle stability of the Sony Xperia Z2 Tablet is very good. Even very flat viewing angles are no problem for the tablet. Colors remain stable, only the brightness of the panel starts to decrease with more than 45 degrees. We could not determine ghosting, which is caused by a gap between the display glass and the panel itself. Viewing angles Sony Xperia Z2 Tablet. 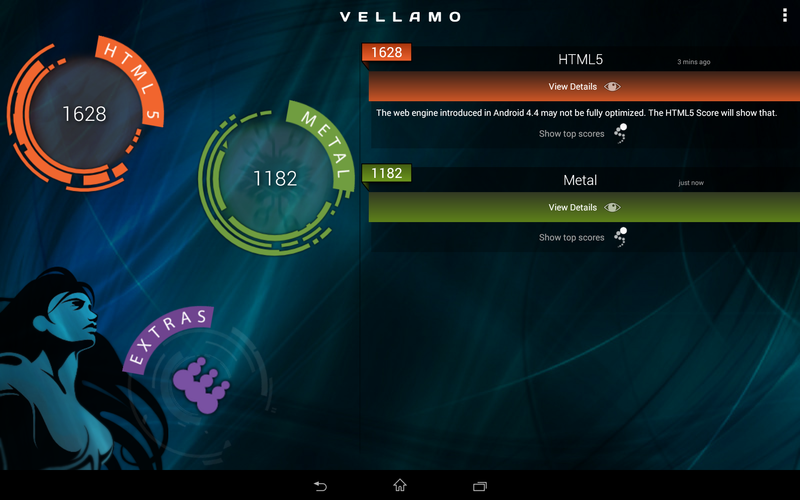 The Sony Xperia Z2 Tablet uses the latest processor generation from the manufacturer Qualcomm. The Snapdragon 801 APQ8074AB has four cores with a clock of up to 2.26 GHz each. The LTE version uses the technically identical MSM8974AB with the same clock; the only difference is the modem. Compared to the predecessor, the CPU did not really change, but the Adreno 330 GPU got a few MHz more and now runs with 578 MHz (+28 MHz). More performance is provided by the strongest SoC from the series, the MSM8974AC (up to 2.45 GHz), which works in the Samsung Galaxy S5. 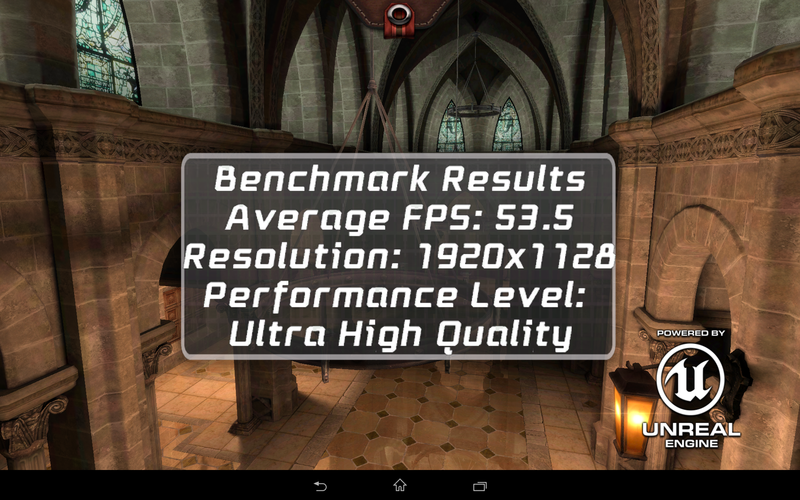 The benchmark results of the Z2 Tablet are very good. 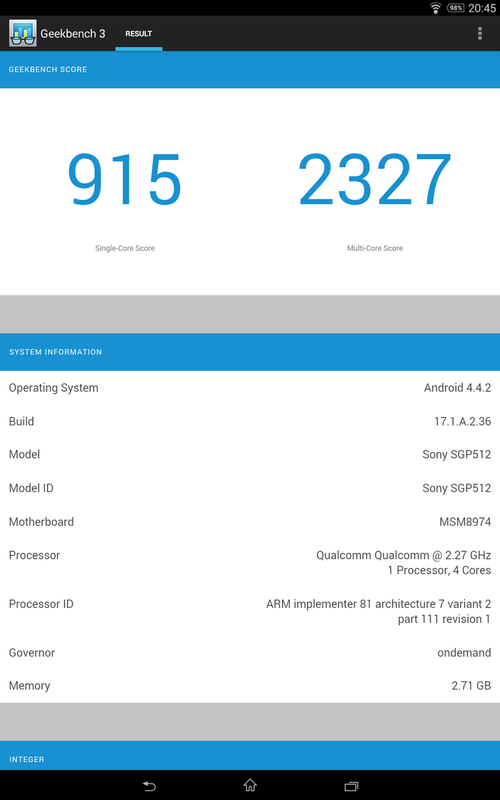 Only Geekbench 3 shows a worse result for the SoC compared to supposedly slower rivals. One reason for that might be that the apps are not yet familiar with the new processor. The situation is similar in Linpack, where the review unit only manages 600 MFLOPS in the multithread test. 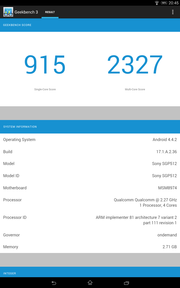 Despite the Snapdragon 800, the Sony Xperia Z1 almost reaches 1,000 MFLOPS. 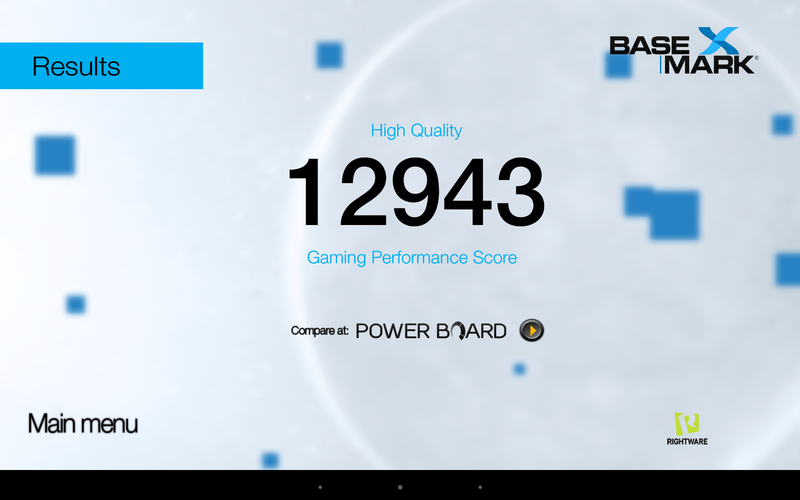 3DMark on the other hand shows that the processor is on the same level with its predecessor with a Physics score of 16,678 points. However, that was to be expected due to the similar clock and the same number of cores. 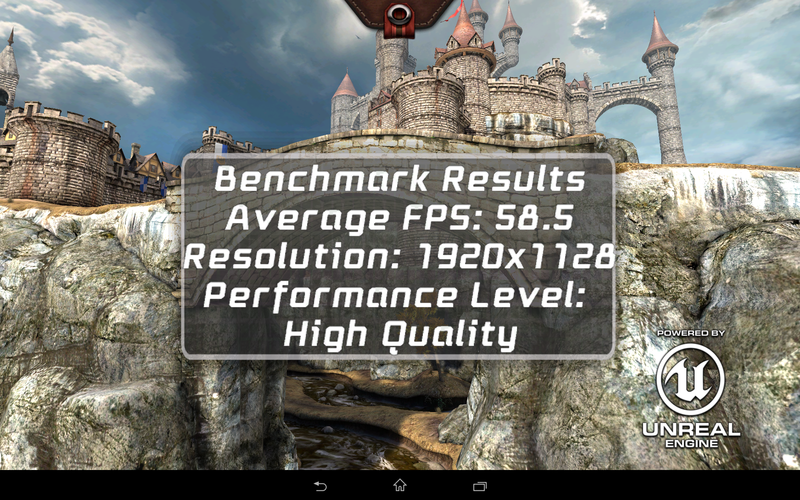 The slight MHz increase for the GPU is sufficient to get the top spot in graphics performance from the iPad Air. 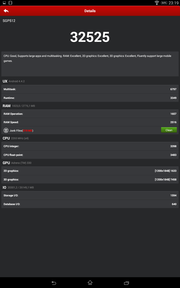 The tablet from Apple is beaten in 3DMark and GFXBench as well. 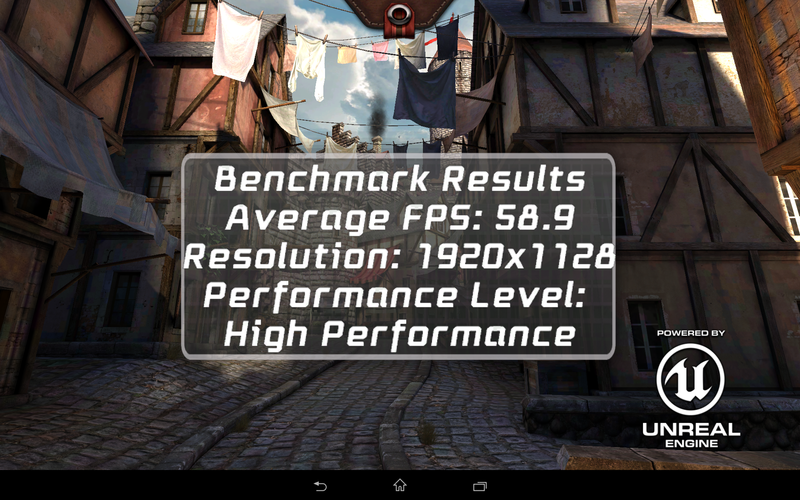 So the Xperia Z2 Tablet is a very fast device and provides a lot of performance. We did not notice delays in practice, either. Android runs smoothly and without hiccups. 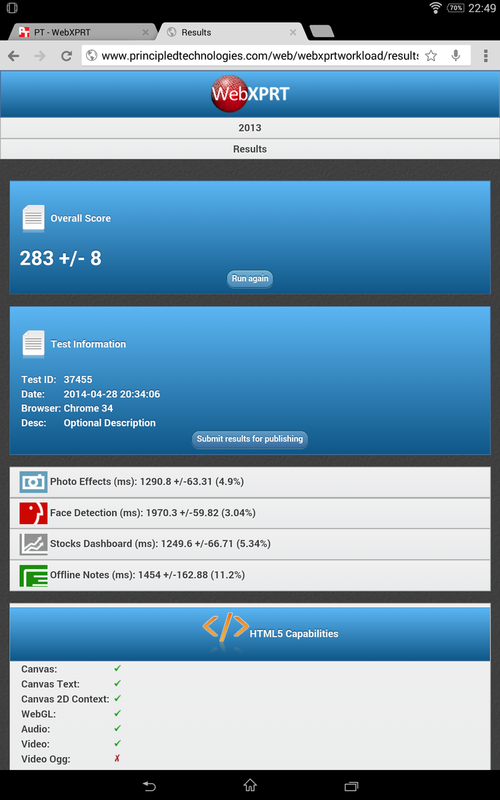 The browsing performance of the Sony Xperia Z2 does not cause any criticism. 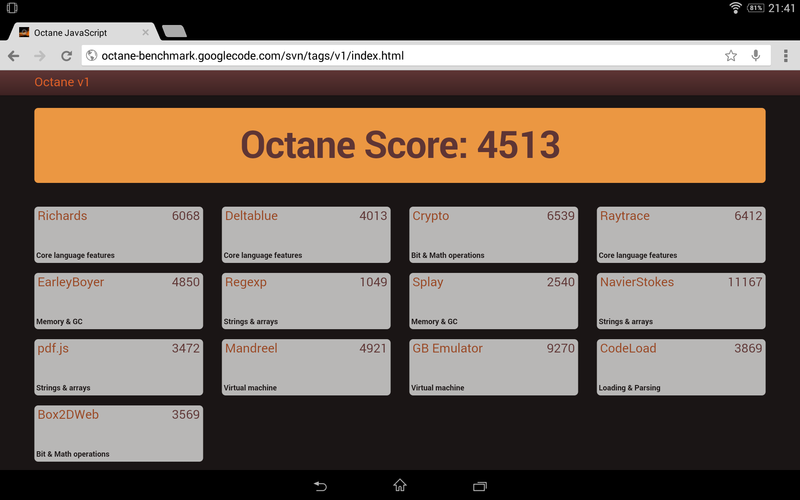 It gets good results in all benchmarks, which were performed with Google Chrome 34. Rivals with the Windows OS usually fall behind our review unit, only Sunspider 1.0 shows an advantage for the competitors. However, Apple's iPad Air is in a class of its own and manages better results in every test. The storage of the Sony Xperia Z2 Tablet is faster compared to the predecessor, but it cannot keep up with the Samsung Galaxy Note 10.1 in most areas. Only the sequential writes of the Sony tablet are slightly faster. The review unit does, however, leave a good impression compared to the other rivals. The Snapdragon 801 would support eMMC 5.0 compatible storage, which would be much faster, but the manufacturer did not integrate it. Besides the reviewed version with 32 GB storage (24 GB available for the user), there is also a version with 16 GB. The Z2 Tablet with the LTE modem is only available with 16 GB. 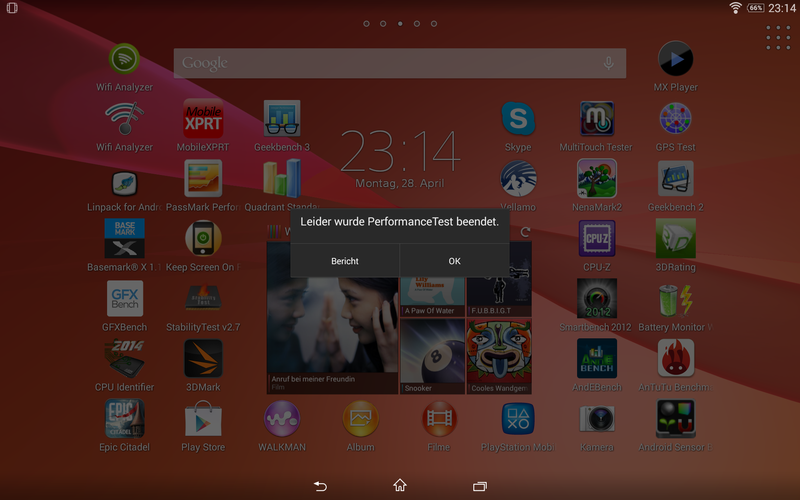 Thanks to the powerful GPU Qualcomm Adreno 330, the Sony Xperia Z2 Tablet does not have problems with any game from the Play Store at the highest details. 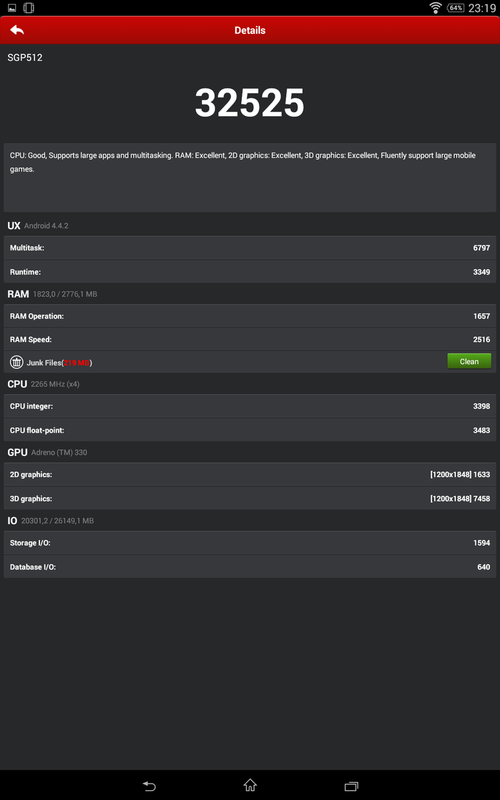 The tablet does support OpenGL ES 3.0, so it should be well suited for the future. The precise sensors and the excellent touchscreen complete the good gaming experience. It is also very comfortable to hold thanks to the low weight. The Sony Xperia Z2 Tablet is significantly cooler than its predecessor. We measured a maximum temperature of 28.8 °C (83.84 °F) while idling, whereas the Tablet Z was 10 °C (18 °F) warmer. Only the Surface 2 is cooler within the competition with up to 28.3 °C (82.94 °F). Especially the Lumia 2520 (up to 33.6 °C; 92.48 °F) and the Galaxy Note 10.1 (up to 33.3 °C; 91.94 °F) are warmer, but no device is in a critical range. Under load, the Z2 Tablet warms up to 38.0 °C (100.4 °F). This temperature is the result of the app Stability Test, which stresses the processor as well as the graphics card, for one hour. This represents an extreme scenario and is not very realistic. The Surface 2 (up to 35.3 °C; 95.54 °F) and the Note 10.1 (up to 35.6 °C; 96.08 °F) run a bit cooler. The iPad Air (up to 42.1 °C; 107.78 °F) and the Lumia (up to 41.1 °C; 105.98 °F) on the other hand get slightly warmer. (+) The average temperature for the upper side under maximal load is 29.8 °C / 86 F, compared to the average of 30.7 °C / 87 F for the devices in the class Tablet. (+) The maximum temperature on the upper side is 32.7 °C / 91 F, compared to the average of 34.8 °C / 95 F, ranging from 22.2 to 51.8 °C for the class Tablet. 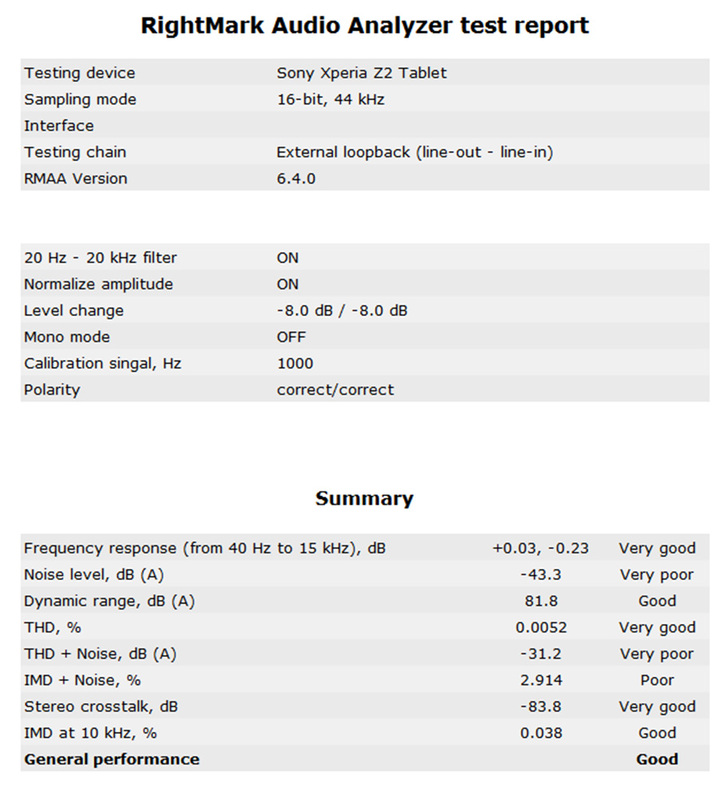 The two stereo speakers of the Sony Xperia Z2 Tablet leave a rather average impression. High tones sound a bit muffled and distort a bit with higher volumes. Bass is perceptible, but very thin; the medium tones on the other hand are comparatively good. The speakers might be sufficient for the road, but we recommend external speakers or headphones if you want to watch a movie and prefer a decent sound experience. The position of the speakers changed compared to the predecessor. They are now integrated into the left and right display frame. This is actually not a bad idea, because they are now faced directly towards the user. Unfortunately, they are quickly covered by the hands, which obviously affects the sound quality and the volume. 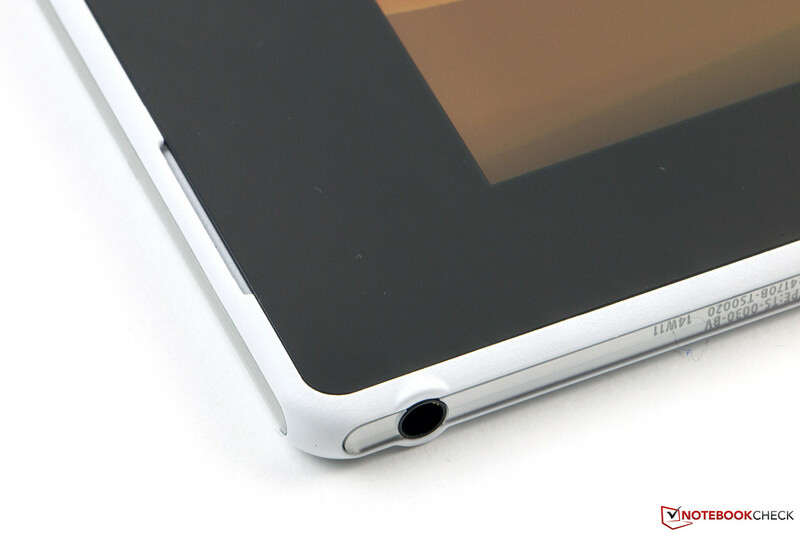 The solution of the Nokia Lumia 2520 with the speakers in the lower display frame is better. The stereo jack does a good job. RightMark Audio Analyzer only determines small deficits in regard to the intermodulation and the harmonic distortions, so there can be audible acoustic feedback with higher volumes. 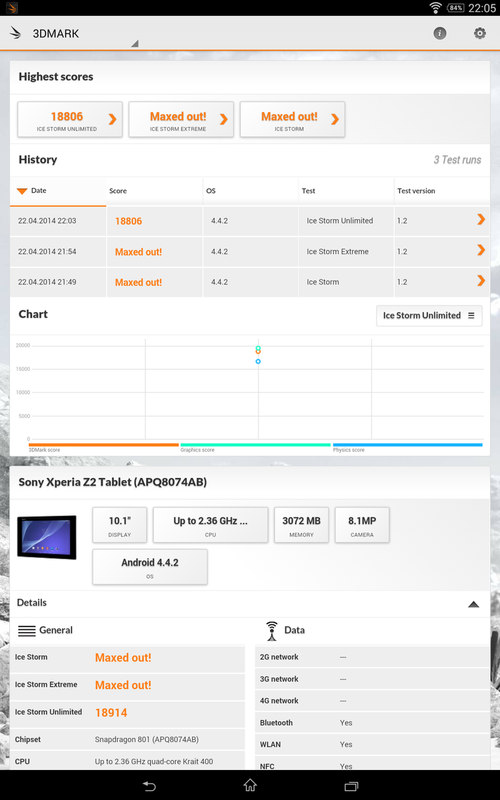 The power consumption of the Sony Xperia Z2 Tablet is comparatively low. It consumes between 3.5 and 5.7 Watts during idle. Only the Surface 2 is more frugal when set on maximum luminance (up to 4.1 Watts), and the most energy is consumed by the iPad Air (up to 7.1 Watts). 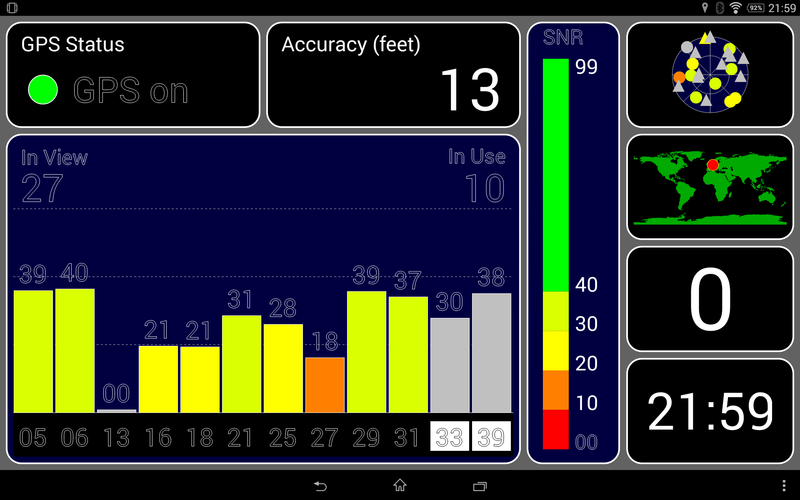 However, the minimum consumption of the Z2 Tablet is higher than the rivals that need around 2 Watts. Under maximum load, which is simulated by the app Stability Test, our review unit is surprisingly frugal. Up to 7.4 Watts are pulled from the battery. Windows tablets have the highest consumption values. 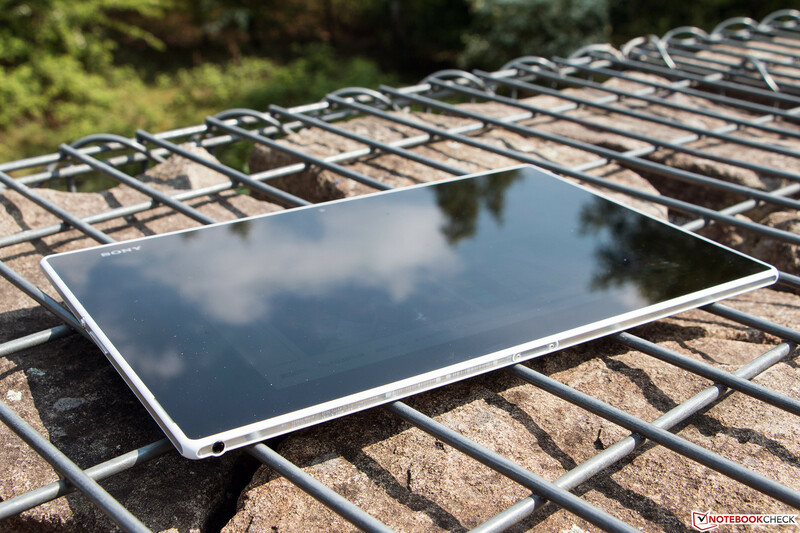 The Tegra 4 of the Surface 2 consumes up to 15.8 Watts. While the display is probably the biggest consumer of the Lumia 2520, the consumption is still surprisingly high with up to 14.5 Watts. It seems that the improved energy-saving features of the Snapdragon 801 pay off. The consumption when the device is turned off (0.0 Watts) is exemplary, but it could be a bit lower in stand-by (0.6 Watts). The power adaptor with a nominal output of 7.5 Watts (5 Volts, 1.5 Amps) is not generous, only sufficient. 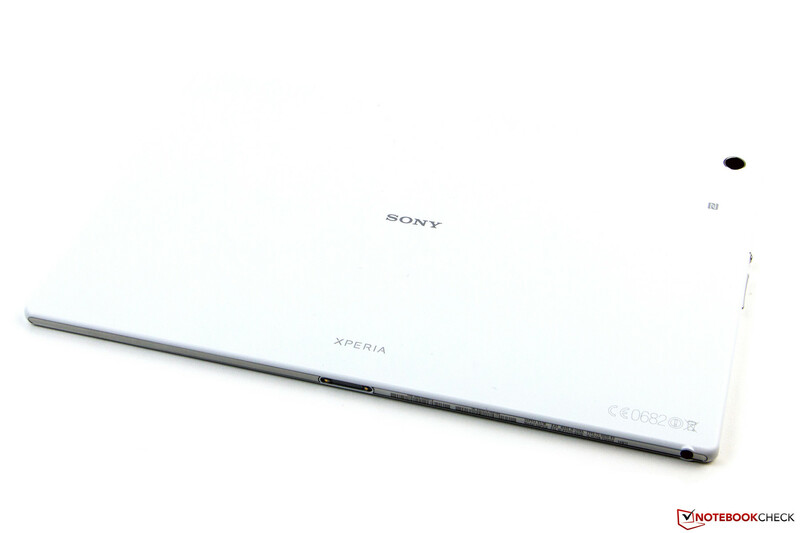 The Sony Xperia Z2 Tablet has a 6,000 mAh (3.6 V, 21.6 Wh) lithium-polymer battery. The capacity is similar to the Tablet Z, but it is supposed to keep the tablet running for up to nine hours, whereas the predecessor had to be recharged one hour earlier. Besides the frugal SoC, this is primarily a result of the energy-saving features of the system. The power limitation in the Stamina mode in particular is very effective and restricts the performance of the processor. The maximum runtime is determined with the minimum display brightness while energy consumers are deactivated. 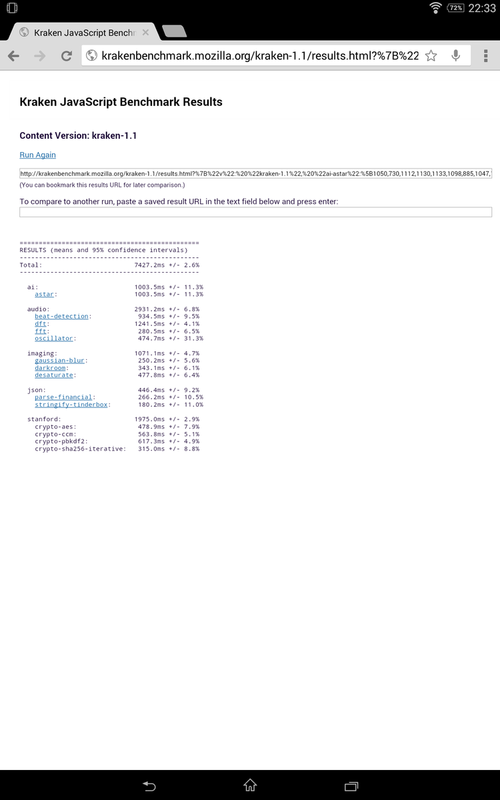 Only the WLAN is still active to run the browser script, which simulates the reading of a document. 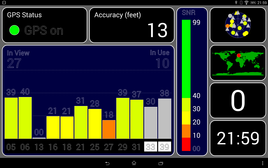 The Z2 Tablet managed almost 22 hours. The other extreme scenario uses the maximum display brightness and runs all energy consumers to determine the minimum runtime. The app Stability Test is supposed to drain the battery as quickly as possible and managed this in almost four and a half hours. More realistic are the tests with an adjusted display brightness of 150 cd/m². The WLAN test only uses the wireless connection to run a browser script that refreshes a website every 40 seconds. Almost ten hours is a very good result for our review unit. The runtime can be further enhanced with the performance reduction, as the video playback test shows. All consumers are deactivated and we run a loop of a Full HD movie. The playback was smooth and without any hiccups for more than 14 hours, despite the limited performance of the processor. 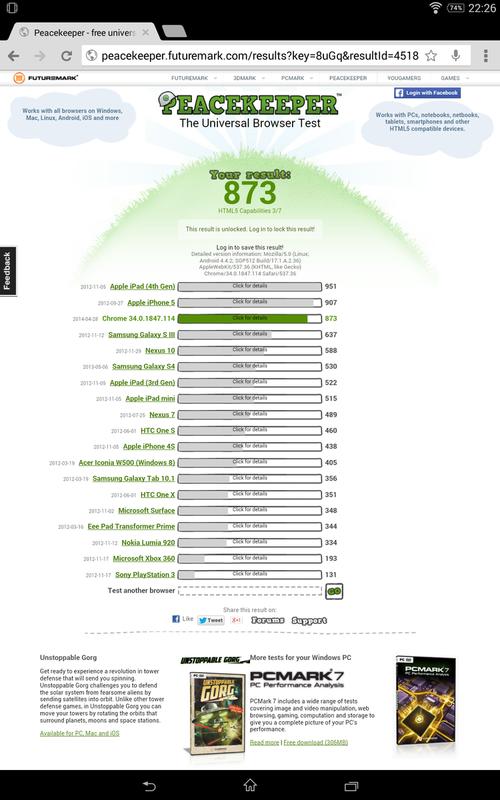 A great result that is neither reached by the Lumia 2520 (11:19 h, 29 Wh) nor the iPad Air (10:44 h, 32.4 Wh). Sony manages a good runtime with the comparatively small battery. You will have to wait around 3.5 hours before the battery is completely charged. 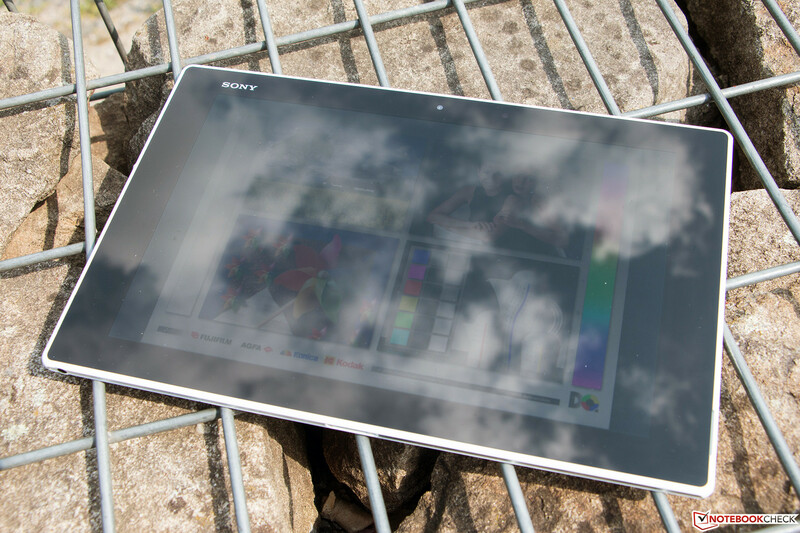 In Review: Sony Xperia Z2 Tablet. 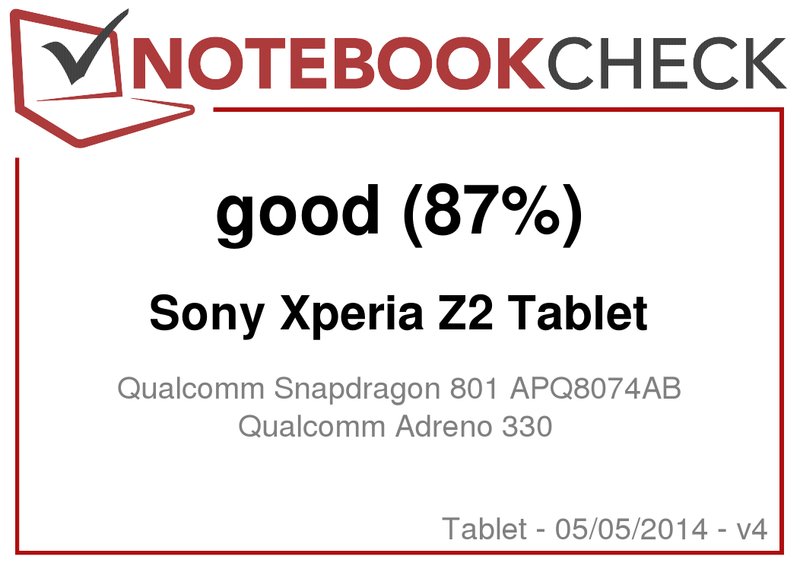 Sony's engineers did a lot of things right with the Xperia Z2 tablet and currently deliver one of the best Android tablets. We can fully recommend the device if you are looking for a fast and thin device with a great display. It is actually the only choice if you want a device that is waterproof and dust resistant. However, there are also some drawbacks. Especially the build quality could be better, and it is still far away from the stability and perfection of the iPad. The display frame in particular is susceptible to pressure. The position of the speakers could be better as well. It will not be a problem when you watch a movie or listen to music while the tablet is in the docking station, but the speakers are quickly covered when you hold the device with your hands. The sound quality also leaves room for improvement. The tablet is a great companion for multimedia purposes and web browsing. One alternative without IP-certification, but with a brilliant panel and great build quality is the iPad Air. Serious working devices on the other hand are the Samsung Galaxy Note 10.1 and the Microsoft Surface 2. Road warriors will appreciate the bright display of the Nokia Lumia 2520. The box is very simple. The panel has a resolution of 1920x1200 pixels. Covers for the memory card slot as well a the USB port. Good position of the stereo jack at the bottom. The back is completely made of plastic. The NFC chip is now at the edge. It is certified according to IP55 and IP58. The Lumia 2520 (8.9 mm) is noticeably thicker. The 7.5 Watt power adaptor is not really generous. 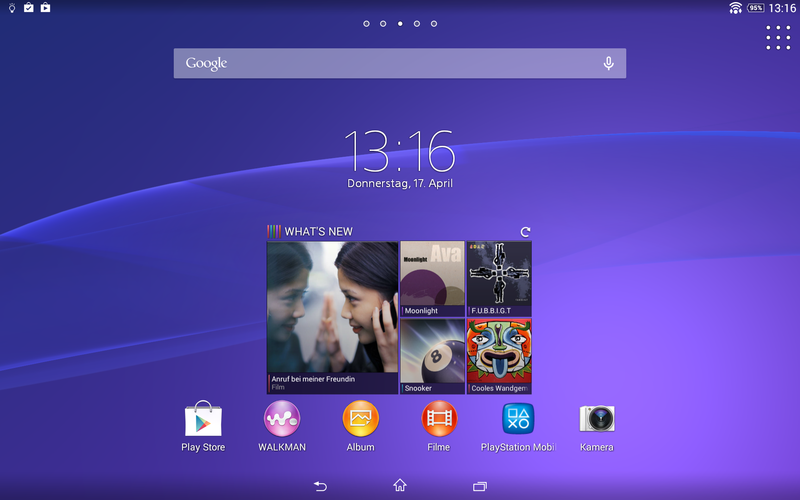 Sony's UI improves the Android design. Google Android 4.4.2 is preinstalled. We could not run PassMark. Sony makes a lot of things right and equips the tablet with a fast and modern SoC and a great display. We also like the current Google Android 4.4 KitKat. The tablet has excellent multimedia features, but the sound is not really convincing. We would have expected better speakers. The Xperia Z2 Tablet is surprisingly light and very thin. You will be surprised when you hold it for the first time. The rivals are Apple iPad Air, Microsoft Surface 2, Samsung Galaxy Note 10.1, Nokia Lumia 2520 and Google Nexus 10.